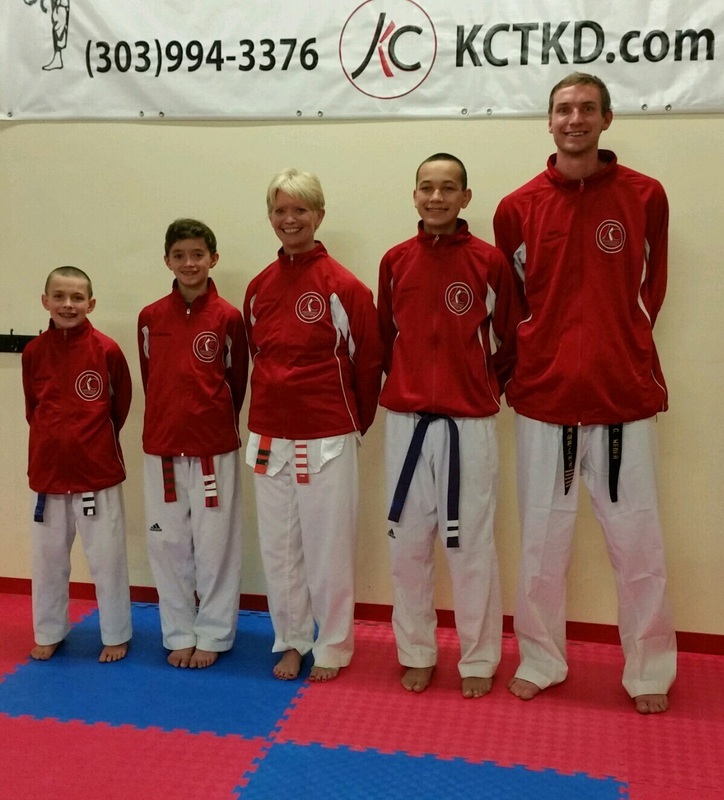 Kim & Cam's Taekwondo Academy is the premier location for Taekwondo, Martial Arts, and Self-Defense in Parker, CO and the greater Denver area. We focus not only on developing students' Taekwondo and self defense skills, but developing the character of our future leaders. We encourage individuals to embody the Tenets of Taekwondo in all aspects of life. Tenets: Courtesy, Integrity, Perseverance, Indomitable Spirit, Self-Control. KC Taekwondo is a great compliment to education as well as mental and physical development. It is an excellent tool to improve fitness and flexibility while promoting a healthy lifestyle for any age. Kim & Cam's Taekwondo Academy is owned and operated by Master Cameron Weber whose lifelong mentor, Grand Master J.W. Kim has provided him with the inspiration and guidance to open a school of his own. Both individuals have dedicated their lives to Taekwondo and the well-being of children, teens, and adults alike. At KC, we are dedicated to providing the highest quality martial arts instruction in the Parker, CO area. We strive to preserve the integrity of the Martial Art of Taekwondo. Kim & Cam's Taekwondo Academy is one of the few schools in the world that teaches both the traditional International Taekwondo Federation (ITF) and the Olympic-style World Taekwondo (WT) styles of the martial art. The motto at Parker's premier Martial Arts School, KCTKD, is 100% Effort! We encourage each student give ALL of their effort both inside and outside of the dojang. We are striving to create champions in the Martial Art of Taekwondo, sport, and life. KCTKD has some very exciting news for 2018!! We are home to 7 STATE CHAMPIONS!! We had seven students compete and qualify at the AAU Taekwondo National Qualifier in Denver. EVERYONE took 1st place and fought extremely well. This is the best result we could possibly hope for. Team KCTKD is #1 and we couldn't be more proud of our dedicated competitors. 6 of 7 students competed in Black Belt divisions, making this result even more impressive!! 2017 Nationals was a wonderful success! KCTKD is now home to 5 National Champions and 10 National Medalists after only a few years of competing! Congratulations to all of our amazing students and their wonderful dedication to bettering themselves as athletes, Martial Artists, and people. I am most proud of how our students conducted themselves using the five tenets of Taekwondo. Always bowing to referees, coaches, and competitors. Always congratulating opponents. Always winning and losing with grace and self control. This is what truly sets KCTKD apart on the National stage, the high level of respect each of our competitors demonstrates! Brady: Competed in BOTH Advanced forms and Advanced Sparring and is our most well rounded competitor! The 2016 USA Taekwondo National Championships were also a giant success for Team KCTKD! With over 5000 competitors this is the largest Taekwondo Competition in the World! KCTKD was the only Martial Arts program in Parker, CO to qualify students for the 2016 National Championships. 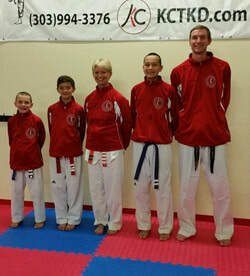 KCTKD earned the best results of any Taekwondo School in Colorado with 4 out of 5 of our students taking home medals. Master Cam- 1st Place (National Champion), World Class Black Belt (1st-9th Dan), age 18+. Jaden- 1st Place (National Champion), green/purple belt, age 15-17. Colin- 2nd Place, red/brown belt, age 12-14. Patti- 2nd Place, yellow/orange belt, age 59 but sparred in age 33-40. Brady- Didn't place but performed his very best in 10-11 green/purple belt sparring and forms. Congratulations to Olympian, Jackie Galloway for earning a bronze medal at the 2016 Olympic Games. Here she is training in Korea with Master Cam, one of her 2013 US Teammates. Every 4 years only 2 men and 2 women earn a spot on the US Olympic TKD Team. This is an outstanding honor and accomplishment in and of itself! ​Take a look at the KC Taekwondo Academy Mannequin Challenge. Our Taekwondo school keeps up with the latest trends and encourages a fun, friendly environment for young children, families, and serious athletes/competitors alike.